For a truly world class kayaking experience in North America, there are few locations that can rival the beauty and variety of the San Juan Islands. This scenic archipelago is located in the northwest corner of the US, nestled between the Strait of Georgia and the Strait of Juan de Fuca in Washington State, not far from the Canada-US border. One of Washington's most impressive natural tourist destinations, the San Juan Islands have earned a reputation for providing truly unique and spectacular kayaking opportunities. At high tide, the archipelago has over 400 islands and rocks to explore and navigate, making it a wonderful destination for kayakers with the spirit of adventure in their souls. Various kayaking rentals, tours, and outfitters can be found in the area and the San Juan Islands are especially remarkable for their vast array of flora and fauna. Orca whales, seals, sea lions, otters, octopi, starfish, and all sorts of other animals can be spotted along the various twisting, turning kayaking routes among these pristine islands. Kelp forests and coves can be found all around and the San Juan Islands boast the sort of scenery that dreams are made of. So if you’re looking to enjoy some truly unbeatable kayaking in the northwestern region of the US, the San Juan Islands are undoubtedly the number one place to be. Since kayaking is such a popular activity at the San Juan Islands, a plethora of kayaking companies can be found dotted around the archipelago and nearby areas. These kayaking companies provide rentals, outfitting services, and guided kayaking tours around the major islands of the San Juan archipelago like Orcas Island, San Juan Island, Lopez Island, and others. Here are some of the top rated kayaking companies you can check out on your next San Juan Islands trip. Sea Quest Expeditions provides a huge range of kayaking tours of the San Juan Islands. The tour lengths can range from as short as a few hours to as long as 5-day expeditions. A whole range of specialized tours are available too including women-only kayaking tours and customized private kayaking tours. All tours are led by experienced guides and will give you a great chance of seeing orcas, as well as eagles, seals, otters, and other wildlife. With nearly four decades of kayaking experience in the San Juan Islands area, the folks at San Juan Kayak Expeditions know these waters better than anyone else and provide some of the most entertaining and exciting kayaking tours in all of Washington State. Both single and multi-day tours are available, including some tours designed exclusively for whale-watching, and kayak rentals can also be enjoyed at this outfitter for people who want to head out on their own without a guide. Focusing mostly around the San Juan Island area, which is said to be the best location in the archipelago to spot orcas and other wildlife, San Juan Outfitters provides an array of exciting sea kayak tours, including whale watching expeditions and combination trips that also involve a short flight on a seaplane. If you’re looking for adventure at the San Juan Islands, this is the place to start. With a wide selection of top class kayaking tours to choose from, Crystal Seas Kayaking takes San Juan Islands kayaking to the next value. These great value tours range in length from three hours to full day experiences and can be combined with camping, cycling, hiking, and other fun outdoor activities in the San Juan Islands area. Sunset kayaking tours are also available and specialized tours designed for families with young children are also very popular with this particular kayaking company. Let the spirit of adventure wash over you as you explore the beautiful San Juan Islands from the comfort of a kayak. 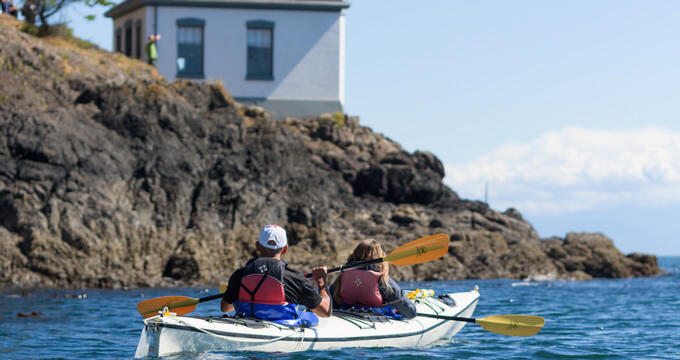 See orcas, dolphins, starfish, seals, and more along the way and learn all about these incredible islands and their many inhabitants with educational talks and Q&A sessions with Anacortes Kayak Tours' trained and experienced guides. Both short and long tours are available, with 3-day expeditions proving very popular and giving you and your group a myriad of magical memories to last a lifetime.